Dell has officially launched its new computer, the Studio XPS 435 Desktop PC. Available now at a starting price of $1099, this latest offering from the most popular name in desktop production is designed to provide expandability and elite performance. The sleek Studio XPS 435 is powered by Core i7 processors, with up to 24GB of RAM and 4.5TB of hard drive storage. Its advanced functionalities and features make it one of the hottest items in the PC world today. Providing unequalled reliability and style, the Studio XPS 435 features a sophisticated and clean tilt back design with translucent black and pure white bezel with a super nice crimson orange trim. This multimedia desktop PC combines its power at high-end computing and digital content creation with a peppering of 3D gaming prowess. If you were tempted by the Dell XPS 730x Gaming Desktop but were put off by its $4,000 price tag, then you should consider the Studio XPS 435. 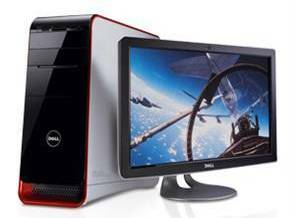 According to Dell, however, their latest computer is intended to be a multimedia desktop, not a gaming monster. The Gigabit Ethernet connections and the 7.1 channel surround features are standard, but the WiFi technology and the Blu-ray drive are optional. The desktop PC also comes with a Firewire port, four USB ports, an eSATA connection, and a 15-in-1 card reader. All in all, the Dell Studio XPS 435 Desktop PC is an impressive machine. Shipping will start on March 19.